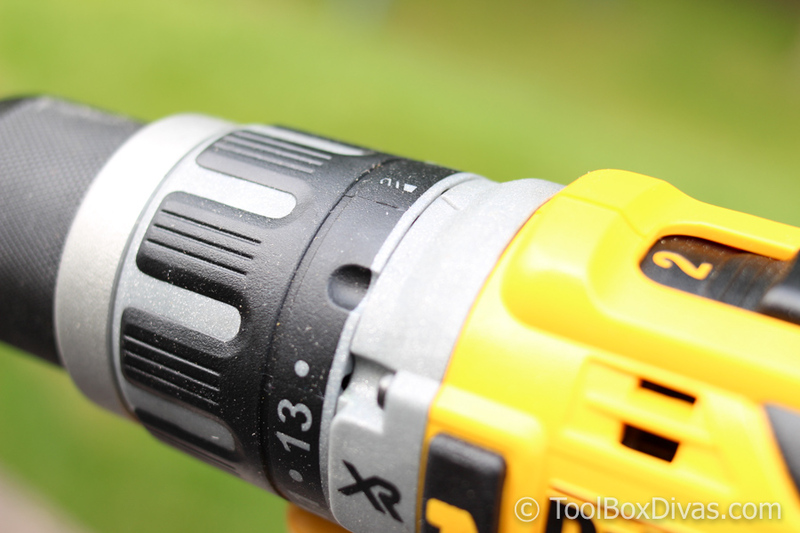 This post is a review of the DEWALT 20-Volt Cordless Brushless Drill/Impact Combo Kit. A drill is easily the most essential tool in the home. From simple tasks like installing window treatments to building furniture and remodeling a home, a drill is required. So it’s important that the drill we spend our hard earned money on works fits the task that we performing and works when we need it. This review is on the DEWALT 20-Volt MAX XR Lithium-Ion Cordless Brushless Drill/Impact Combo Kit. This is not a light duty drill kit. The DEWALT 20-Volt MAX Cordless Brushless Drill/Impact Combo Kit is a powerful combination, equipped to handle larger jobs. This kit comes with a brushless compact hammerdrill/ drill driver and a brushless impact driver, as well as two 20-volt Lithium-Ion batteries and charger. The brushless motor enables 57% more run time over the average brushed motor drills. The 20-volt battery system offers power like no other. The brushless compact hammerdrill/ drill driver weighs 3.5lb. It has a variable speed trigger switch with a brake. It has an adjustable chuck, up to 1/2.” It has a LED work light feature that operates on a timer. The light is also activated when you pull the trigger on the drill. This is great for working in dark areas. The directional light provides spotlighting. This drill has a high-speed transmission with 2-speed settings. You can easily adjust the speed and torque for drilling, screwdriving and hammerdrilling using the torque collar and gear shifter. The Dewalt 20-Volt MAX Cordless Brushless Impact driver is compact and weighs only 2.8 lbs., making it perfect for tight awkward spaces. It also comes equipped with an LED work light that turns on when the trigger is pulled. This impact driver has a 1/4″ quick release hex shank. The Dewalt 20-Volt MAX Cordless Brushless Impact driver has 3 operating modes. With each mode, the rpm and torque increases. Mode 1 is the Precision Drive mode. Mode 2 and 3 are the typical impact modes. However, the Precision Drive mode is a unique feature that comes in super handy when working on light projects that require less force, reducing the likelihood of stripping the screws and damaging the work surface. It allows the driver to operate similarly to a screwdriver. DEWALT 20-Volt MAX XR Lithium-Ion Cordless Brushless Drill/Impact Combo Kit operates on a 20V MAX Lithium-Ion battery system. It provides up to 60% more capacity than standard 20V MAX. This combo comes with 1 premium XR and 1 compact XR Lithium-Ion battery packs and a chrarger. Each battery has an LED fuel gauge, which allows you to check the power level of the batteries at any time. The tool comes with a 3-year limited warranty, 1-year free service and 90 days money back guarantee. The battery has a 3-year limited warranty and 3-year free service. I’m so sorry you’ve experienced that. All in all this is an excellent tool. I really like it. I haven’t had mine long enough to judge the longevity of the batteries. But I will definitely do a follow-up. I own a drill, drill driver, jig saw and the 6inch skill saw sadly they are all 18 volts and like the man said the batteries just won’t hold up to heavy use and being recharged for very long and when they die it’s cheaper to purchase the 20 volt tool that is if you can get it with the batteries rather than buy the high dollar 18 volt replacement batteries.